Summertime was great, wasn’t it? No school, no waking up at 6-ish to drive everyone everywhere. The kids napped for sure on Fridays, because they’d stay up super late Friday nights. It was (still is) movie night, popcorn night, and spend time with daddy night, since he usually isn’t home until their bedtime on most nights. I miss those naps. I miss sleeping in on Fridays because I didn’t have to work, and the kids didn’t have school….and we could be lazy until like 8:30am! I loved summer time naps. I’d get the kids settled in my bed, sitting next to them with my trusty Kindle. On the perfect day, windows would be open, and a slight breeze might blow in now and then. 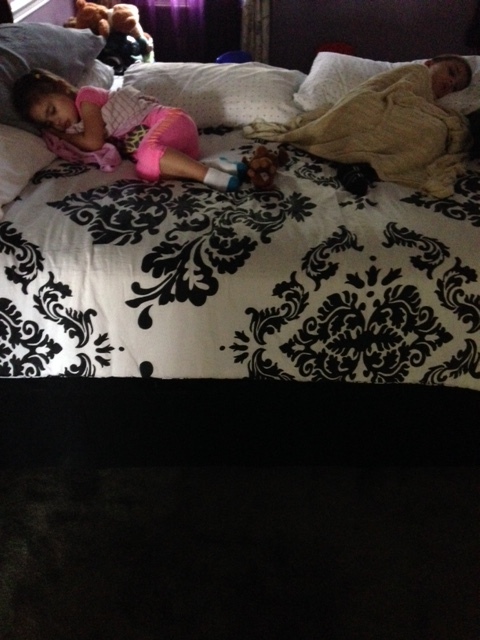 Sometimes I’d sneak out when they fell asleep, and do important grown up stuff like laundry, dishes, washing floors. Other days, I would sit there with them and read until they woke up. Savoring the quiet, lazy feeling of just sitting still. It’s not done a whole lot around here. So guess what happened today? Slept through the alarm, woke up after 7am. Panicked a minute. Decided to take a mental health day. Kept the kindergartener home (don’t judge me). Spent the morning playing with our baby cousin, then drove home. Both kids fell asleep in the car. And now… here I sit, in the glorious quiet of a perfect Friday afternoon. This entry was posted in friday night, growing up, kids and tagged friday, growing up, kids, nap, quiet time. Bookmark the permalink. 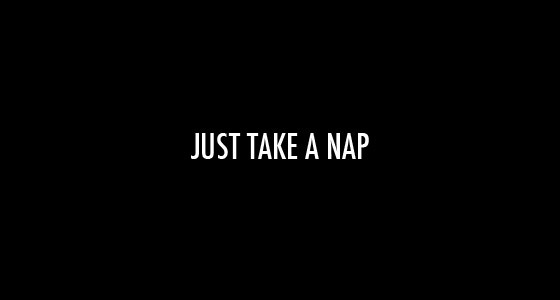 I’m right there with you about naps. It’s almost 2pm and I’m waiting for the little one to pass out. it usually happens around now. If I can get him down for even a little I might take my own nap. I contemplate keeping the kinder kid home from school about 3 out of 5 days a week! Sleeping in would be SO awesome but I don’t see that happening until they are in high school at this rate. My kids seem to be allergic to night sleeping…every other time of the day they go down easy and at night they are WIDE awake. 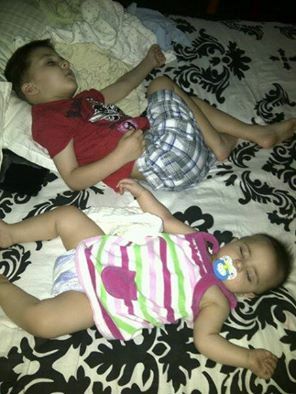 I have also wondered how is it that the kids sleep so peacefully at nap time, but NEVER sleep through the night. We’ve graduated from the nights of screaming/crying for no reason, to the little ones taking turns waking up for water, needing to pee, wanting me to rub their tummy or back…. don’t actually know the last time I slept a night through… but one day, it will happen!! I think.